Feel free to consult it to access the latest tutorials or information. What is PHP CRUD Generator? 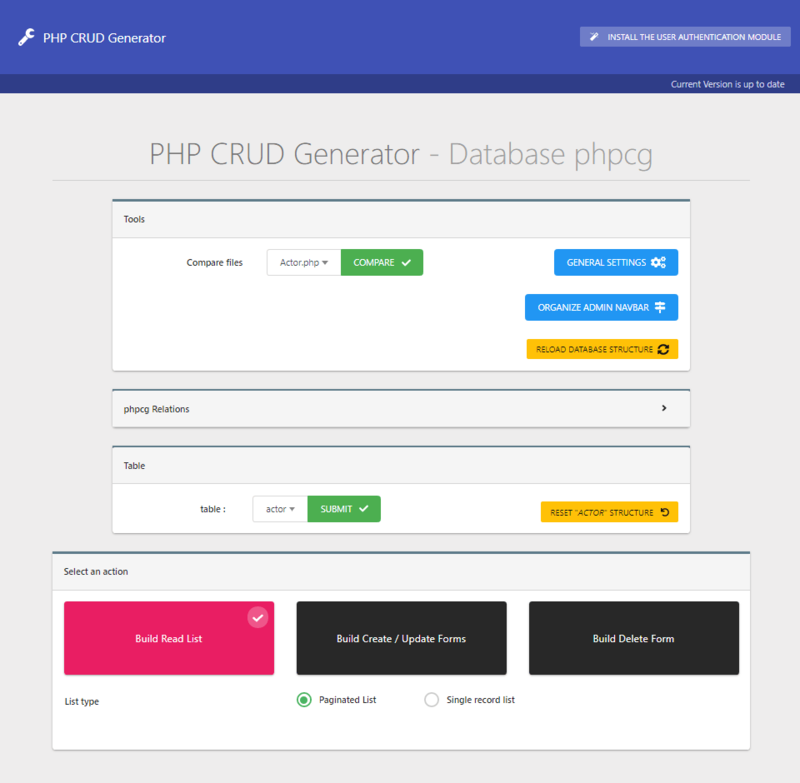 PHP CRUD Generator is a program developed in pure PHP for building complete website administration panels using a visual interface. PHPCG is suitable for both non-programmers and advanced PHP programmers, who will have access to a clean and well organized code so they can take advantage of all its potential. PHPCG is able to analyze your database, extract tables, fields and any type of relationship intelligently. The "generator" folder is only required to build & edit your CRUD admin panel. You can use the local generator to create your admin panel then upload the "admin" folder to your remote server. 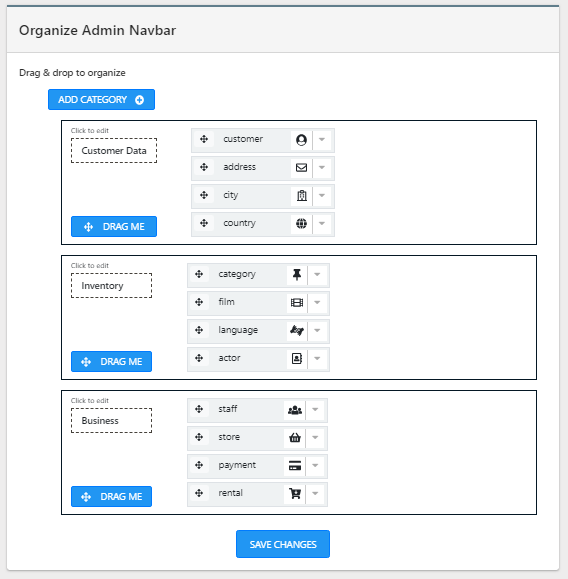 OR create the admin panel directly from your production server. the generator folder is required on your server. 2Open the installer - install/index.php - in your browser. If you use a local server + a remote server, you must run the installer on both. You'll have to enter your database connection settings for localhost or production server + basic general informations. 3 All is now ready to generate your admin panel using the CRUD Generator. Open the generator - generator/generator.php - in your browser. Done - when you open generator/generator.php in your browser you'll be redirected to the login page. Enter your registration email & your purchase code to login. Choose your database in the dropdown list and validate. You will then see the complete panel appear. Click the "Add Filter" button in the Read Lists generator form to add a new filter. This will add a new filter to your list. You just have to choose the field to filter in the dropdown list. if you want to display 2 or more values in the admin dropdown list. For example the first and last name are displayed and the filtered value is the ID. if you want to filter values from external relationships. To use advanced filters it is necessary to enter query parameters with joins. A help button is available to help you build your query, as well as a preview button that allows you to view the generated drop-down list and check its validity. The User Authentification Module installer allows you to configure the rights access to the admin items. It must therefore be installed last, after having created all the elements of the CRUD. Click the Install User Authentification Module button to launch the installer. You will also have enter the main administrator informations. The main administrator can then manage users and profiles in the admin panel. Click the Organize Navbar button to open the tool. You can group the CRUD elements into categories and choose icons for each one. If your database structure changes along the way, PHPCG is able to rebuild the data and allows you to regenerate the corresponding CRUD pages. When generating administration panel pages, PHPCRUD automatically keeps a backup of the previous version. The file comparison tool integrated with the generator allows you to compare side by side your current version and the previous one, and to merge them by choosing the code blocks to be retained. Administration customizations can thus be retained during version/structure changes. When a new version is released, you'll see the "New PHP CRUD GENERATOR version is available" message in /generator/generator.php and will just have to click the "Install" button. Copy /generator/update folder to /generator/update on your server. Open generator/update/first-update.php in your browser. This will install /vendor folder on your server and replace /generator/generator.php with the new version included in this package. Open /generator/generator.php in your browser and click the Install button. PHP CRUD Generator and the generated website admin panel are both fully multi-language. Duplicate admin/i18n/en.php and rename it to your own language. Open conf/user-conf.php and replace define('LANG', 'en'); with the filename you used previously. You're welcome to send us your translation, it'll be useful for other users. 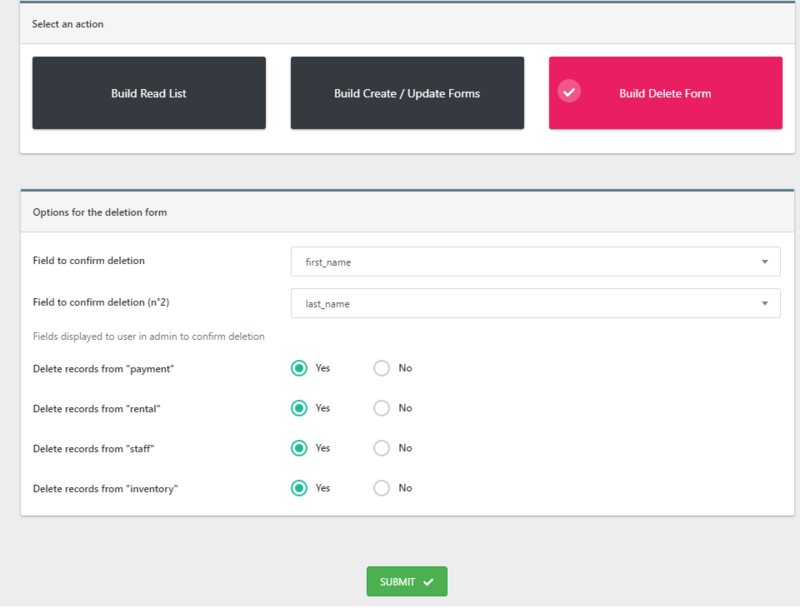 PHP Form Builder is included in the package and you can use it without restriction on the same domain as your CRUD. This means that you can build any form you want on your website/project and use the integrated plugins & functionalities. The PHP Form Builder version included with the CRUD may not be the very very latest, so some functionalities may have changed a bit, especially concerning the plugins. ie: domain.com, domain.eu, domain.co.uk are all valid with the same license. - ADMIN panel: register URL query parameters in $_GET (Altorouter ROUTES doesn't deal with these). even if there's several external nested tables in the list. Warning: If you admin READ lists have date or datetime fields, open the corresponding templates in /admin/templates, find the functions toDate(...) and replace the date PHP format with the corresponding ICU date format. - PHPCG includes now the complete latest PHP Form Builder version with all its features & plugins. - After this update you may have to reinstall the user authentification module from the Generator page. - the User Authentification Module now keeps the users & users profiles tables and records when uninstalling. password are now automatically optional on update forms with an helper text: "Leave blank to keep the current password"
- move the install folder outside the generator folder. Warning: if your authentification module is not enabled, after the update open php-crud-generator/conf/admin-lock.php and set ADMIN_LOCKED to false.